We have been extremely satisfied with VTech® products in the past so I was excited to try this new phone system. We were not disappointed because this new model VTech® uses HD audio which has the clearest sound that I have ever heard on a telephone. It also features Push-To-Talk technology which allows the phone system to be used as a talkie system so that you don’t need to shout through the house anymore to communicate. For example, if my husband has a handset with him while working in the garage, I can signal him from the bedroom on the other side of the house. The Voice Announce Caller ID is very helpful to make screening calls easier than ever. What makes this feature so unique and helpful is that it is audibly announces the name/number of the caller so there is no more scrambling to find a handset to see who is a calling. For us that means no more frustrating interruptions by telemarketers while we are eating dinner together as a family. 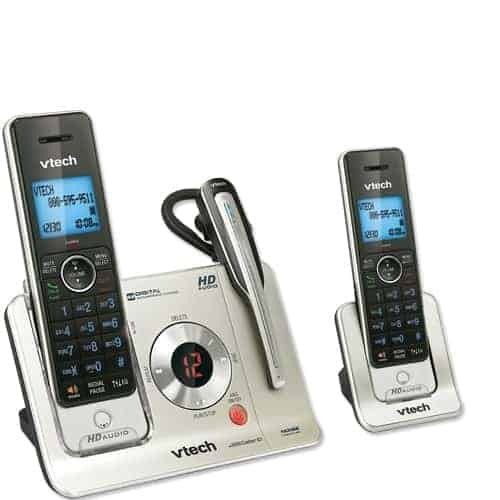 This VTech® handset system requires only one phone jack to use the two handsets that are included. I placed the second handset next to my bed and plugged it into the electrical outlet and it works great. This handset system is even expandable to up to 12 devices. My favorite feature is the Multiple Headsets that are included. I received three different sized headsets including ear hooks and over the head bands plus four different sized ear buds to ensure that it is as comfortable as possible to use the hands free style. When doing tedious tasks like laundry or cooking dinner, I can call my mom and chat about our day. The digital answering machine is easy to use and accurately records voice messages with excellent clarity. In the past, I have missed important messages because I could not understand the message that was left due to interference or background static. The frequency band has been extended allowing for the signal to be reproduced and tuned for a fuller and clearer sound. Enjoy the freedom to have a private cordless hands-free conversation anywhere in your home or office. This DECT 6.0 cordless headset gives you the same interference free, superior sound, and long range you expect with a traditional DECT 6.0 cordless handset. Have more efficient conversations with this versatile cordless communication system. The VTech® Two Handset Cordless Answering System is a great option for busy families or for home offices. It is also very affordable with a MSRP of only $99.95 for the entire system. You can learn more about the Vtech® system or purchase it with free shipping available by visiting the VTech® website. Connect with VTech on Facebook and Twitter. I have been eying this phone for a little bit … Thanks for your review! It does help! good things about this brand.